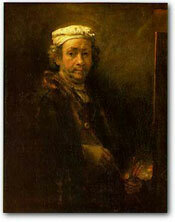 Rembrandt moved me deeply. The great division of Light and Dark, the blending of secondary tones into the larger parts, the melting together of these tones in these parts, which had the effect of a giant antiphony at every distance and immediately reminded me of Wagner's trumpets, revealed to me completely new possibilities, superhuman powers of color in its own right and particularly the intensification of power through juxtapositions [Zusammenstellungen], that is, contrasts. I saw that every large surface in itself contained no fairy-tale quality, that each of these surfaces immediately betrayed its derivation from the palette, but that this surface actually acquired a fairy-tale effect through the other, contrasted surface, so that its origin on the palette seemed unbelievable at first glance. However it was not in my nature to apply a means observed without further ado. Unconsciously I approached strange pictures as I now approach "nature"; I greeted them with reverence and deep joy, but felt, nevertheless, that this was a power foreign to me. On the other hand I felt somewhat unconsciously that this great division gives Rembrandt's pictures a quality that I had never seen before. I felt that his pictures "last a long time," and explained it to myself that I had first to exhaust one part continuously and then the other. Later I understood that this division magically produces on the canvas an element which originally seems foreign and inaccessible to painting -- time.